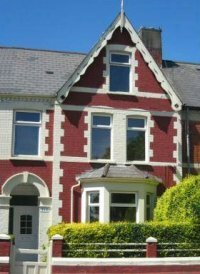 Cardiff Exclusive & Gay Boutique Bed and Breakfast, close to the city centre and the Welsh gay scene, offering personal service a hotel cant match. Our guest rooms, which are named after Welsh castles, have been lovingly and caringly decorated to make you feel comfortable and relaxed. Snuggle up in a luxury bed, in a room complete with matching wardrobe and bed-side cabinets. We hope you will appreciate the quality of our rooms and the attention to detail given to every amenity we offer. All rooms are non smoking, but we provide sheltered outdoor facilities with easy access from the lounge. Ty Rosa B&B oozes style and quality and your every whim is catered for. From the moment you step over the threshold a warm Welsh welcome awaits whether you are lesbian, gay, bisexual, transgender (LGBT) or straight, as we are even hetero-friendly. Complimentary wireless Internet (Wi-Fi) access and comfortable launge are just two of the amenities on offer. There is also ample, free car parking and a bus stop on the street directly outside. We are the best.